Aside from the pun1, there is little to joke about in the character who would prefer all migrants drown rather "soil" Italian land when the real problem is not migrants but the capitalist crisis. Two aspects in particular stand out. 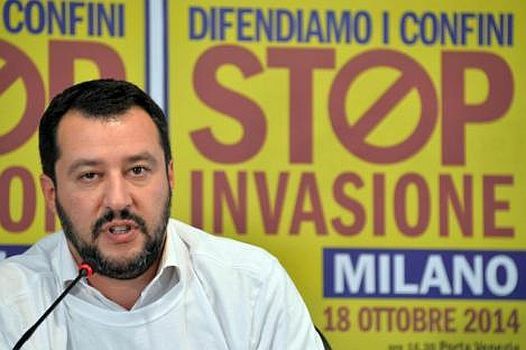 Salvini – saviour of everything and everyone, or almost – had no difficulty speaking out against one of the promises he and his colleagues had made to the 5-star Movement: "I understand that Di Maio wants to counter precariousness, but we must not damage companies and workers who are forced into the 'black' economy because there are too many constraints and costs". No other sentence could have been more effective in reassuring the assembly of representatives of capital, above all businesses, which have suffered most in the storm of the economic crisis in terms of competitiveness, productivity and bankruptcies. Here is the recipe, regardless of all previous promises. Insecurity is a bad thing: for those who work it is a sword of Damocles which very often falls on the head of the working class. Still, if it is necessary for capital, it must be welcomed, with all due respect to everyone, even those who believed Renzi when he said future contracts would favour new kinds of jobs. The government programme also contains a series of undeclared but well-defined immediate objectives, ranging from continuing with the abolition of Article 18, and the Jobs Act to a reform of the Fornero Law3 which they will change in form but not content. These reforms enacted by their notorious enemy Renzi, will be left in place without even a "thank you" to those who, like him, who have worked to keep the fragile Italian capitalist structure afloat, as always making workers bear the burden, bewildering them with ridiculous promises as incredible as they are impracticable in the current crisis conditions of international capitalism. 1. The Italian original title of this article was a play on Salvini’s name “Si Salvi(ni) chi puo” which can be translated as “Every man for himself” but the pun is lost in translation. 2. This is a long running scandal which brought down the founder of the Northern League Umberto Bossi. His successors have since repositioned the party from being a regionalist separatist organisation to a more traditional racist one closer to the Front National in France. Under Salvini they have dropped the “Northern” in order to widen their appeal. As it is they still got few votes in the South of Italy but the coalition with the Five Star Movement (who got 32% in the last election, mainly in the South, and should be the dominant partner in the coalition) allows them to portray themselves as an all Italian party despite the fact that Salvini is on record of thinking that all Southerners are “scum”. 3. Article 18 of the Italian constitution protected workers from unfair dismissal, whilst the Jobs Act was brought in by the Renzi Government to remove some of the previous protections on contracts. The 2012 law, named after Elsa Fornero, then labour minister, shifted workers to a defined contribution scheme, stopped indexing pensions above a certain income level for inflation and increased the retirement age to 67. The aim was to raise cash and reassure markets of the commitment to spending discipline in the eurozone’s third-largest economy. All worsened the conditions of workers in relation to capital.